**I received a copy of this book in exchange for my honest review. All thoughts are my own. Trustworthy devotional moms and dads can use to make bedtime family time, faith time. After the busyness of the day is done, before your child nods off to sleep, snuggle up to read God's Word and daily reminders about how much He loves and takes care of us. 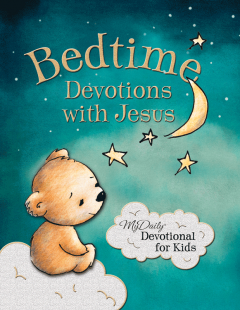 Bedtime Devotions with Jesus is a collection of prayers and devotions written by pastors, pastor's wives, children's ministers, and other church leaders. In this book are valuable lessons on such topics as thankfulness, obedience, trusting God, being kind, loving others, and many more. God's Word comes alive using simple language, and the devotions are featured with delightful illustrations of teddy bears. This book will teach children ages 4-8 the value and joy of spending time with God every day. Each devotional includes a scripture, a brief devotional reading, a prayer, and a meaningful takeaway that helps children build a strong foundation of faith. This is the first children's book in the hugely popular MyDaily™ Devotional line. Devotionals for adults in the MyDaily series have sold more than 173,000 copies. Dr. Johnny Hunt is the senior pastor of First Baptist Church of Woodstock, Georgia. He is a sought after speaker who holds conferences each year for men, senior adults, and youth. He is the president of Timothy Barnabas Ministry designed to encourage pastors and their wives. Devotionals by Johnny Hunt include The One Year Devotional Prayer Book, The One Year Devotional Prayer Book Vol. 2, Pathway to Discipleship, and Walk Through the Word. Now, we have quite the collection of kids' devotionals in our home, and I love that each one offers something a little different from the next, and this one is certainly no different! The devotions in this devotional are broken down into 52 weeks. Each week is written by a different writer, so while there is certainly a common layout, it also allows for some different views and styles to come through as well. I love this aspect of the book, and appreciate being able to read different thoughts from different writers. But again, the style remains the same throughout. Each devotion offers a scripture, a short reading, a prayer and a lesson to take away. They are short reads, which is great for tired kids (or just those with short attention spans). They are easy to understand and relate-able to children too. Truly an ideal bedtime devotional! My kids love it, as do I! Bedtime Devotions with Jesus is available to purchase now at your favorite Christian book retailers! I've been looking for something nice like this to read to our son at bed time. I love that there are children's devotional books so that you and your child can reflect on God's love together :) What ages do you think this particular book is most appropriate for? I believe the recommended ages were 4-7, though I don't recall where I saw that! Haha! But I would definitely think that age group sounds about right! It's really written in a way that is very easy for kids to relate to, but still probably better to read with a parent, so perfect for early readers! Oh this is so cute!! Im definitely picking this up for my son!! Would be a great wind me down before bed :) I pray before bed and I hope that he will too!! this sounds like a good one I like to get these for gifts, esp when making up a gift basket. I love to read things like this to the kids before bed. I love the idea of making this routine! What a perfect send off to bed! I'm going to add this to my must-have list for baby when she gets a bit older. I love the idea of a short Bible time before bed, but so many kid's devotionals are just a little to long or fussy for sleepy kids with short attention spans. I'd rather they absorb less Bible knowledge well and learn to love the experience than try to throw to much at them and have it go over their heads. By and large, a borrower in the US is required to pay approximately 400%, this is as indicated by the Consumer Federation of America. At the point when a borrower neglects to pay the credit inside the given time period, a huge loan fee is again incorporated into the count. As much as best payday advances are useful for the infrequent crisis installment or to help amend an unpleasant time. Shockingly, they are no help to generally stresses. Truth be told, they are counterproductive to most obligation stresses. There is sufficient free non-benefit credit directing administrations that will help kick you off. You need to clear up past weights with a specific end goal to help future achievement. Convenient solutions will just transitory conceal the wreckage for a brief span. Meanwhile you go out on a limb of the issue intensifying into fiasco. Pick the best answer for your own back circumstance.